"It comes in 28 different colors." "The premium off-white pages are made from natural material, which helps prevent eye strain." "With key code pages, index pages, dotted numbered pages, and two color-coded bookmarks." "Ideal to help you brush up on your organization tactics—and give you a new journal in the process." "Not only is the cover durable, but you also have the option to opt for dot grid, grid, lined, or plain paper." "It’s flexible and can be folded to fit in the pocket of a bag, but it’s also durable." "It’s got a transparent hardcover to keep it protected." "You’ll love the pen loop to keep your writing tool secure when you’re on-the-go." 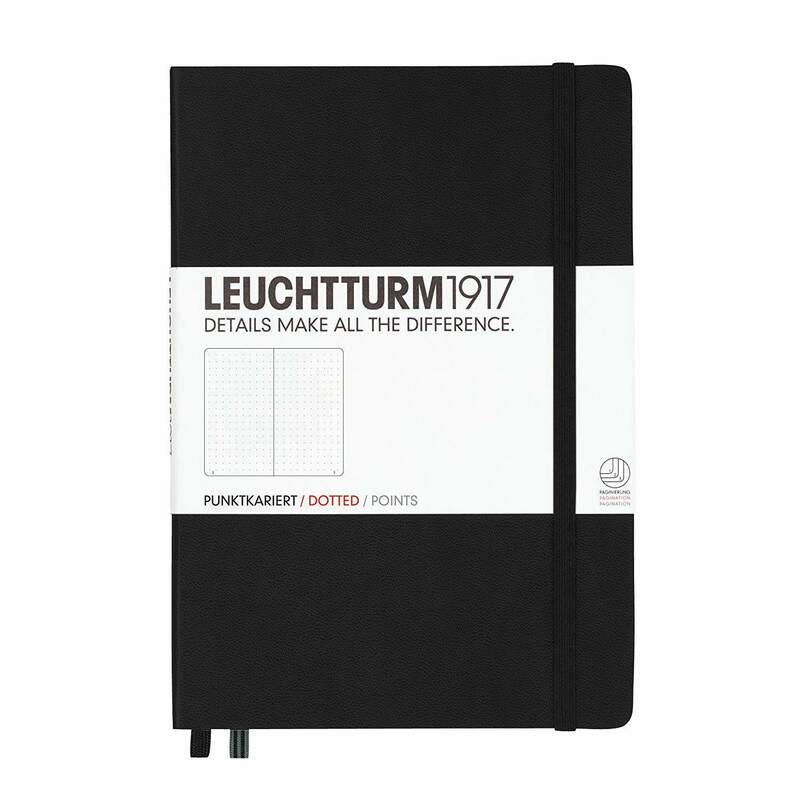 Both new and experienced bullet journalers will fall for this notebook from Leuchtturm. It comes in 28 different colors, so you can go bold with a cherry red or stay business professional with black. The book measures 5.75 x 8.25-inches so it is just the right size to throw in your purse when you are on the go. Each book comes with 249 numbered (writing) pages, 8 perforated pages, a blank table of contents, and a folder in the back so you can stay hyper-organized. The pages have a dot grid which makes bullet journaling even easier. Maybe you are starting off on your bullet journalling journey and you don't want to spend a ton. This dotted grid journal helps you start getting organized without spending a ton and will help you create a routine with ease. It’s got an extremely durable faux leather cover, so you don’t have to worry too much about beating it up on-the-go. Maybe the most unique feature of all, though, is the paper. The premium off-white pages are made from natural material, which helps prevent eye strain. In addition to black, it also comes in brown, dark gray, and orange. it also has lay flat pages so journaling is even easier. Did we mention round corners and a ribbon to help you find your place? Need some help figuring out how to bullet journal? This journal helps you get started out on the right foot, with key code pages, index pages, dotted numbered pages, and two color-coded bookmarks, so you can stay organized and stress-free. It also comes in a variety of different colors, all with ethically sourced, vegan leather cover. It even has a pen test page to test out different pens to make sure they won’t bleed through. Many customers comment that there is minimal to no ghosting (even with Sharpies! ), smooth writing, thick paper, and enough pages for over a year's worth of journaling. We’re all about keeping things convenient, so if you’re just starting out, a bullet journaling set could be the perfect way to go. Even if you’ve been journaling for a while, this set is ideal to help you brush up on your organization tactics—and give you a new journal in the process. With the set you'll get a how-to book that serves as your practical guide to bullet journaling. You’ll learn how to keep your life organized without losing your mind and going totally insane—or worse, forgetting what everything you wrote down actually means. It’ll give you the inside scoop on what symbols are most effective, spreads to plan your day, week, month, or year, and trackers for your goals. And because you’re going to want to get started immediately, it also includes a 208-page blank bullet journal. Consider your to-do list game conquered. Not only does a hardcover journal look seriously sophisticated, but it’s also incredibly durable. If you’re someone who throws their bullet journal in purses, the back of the car, luggage, or just really beats it up on a daily basis, you’re going to want to opt for a hardcover, and this Dingbats journal is the best. Not only is the vegan leather cover durable, but when purchasing, you also have the option to opt for dot grid, grid, lined, or plain paper. Each cover also comes with a cute animal embossed on it. Whatever your bullet journaling style, this models got it. Bonus points that it comes in ten different color options, too! It’s medium sized (6.3 x 8.46-inches), so it’s definitely convenient to take on-the-go, and online reviewers are obsessed. Reviewers say these pages are thick and many say after trying other competitors this one is hands down their favorite. Need some more help finding what you're looking for? Read through our best planners article. If hardcover journals aren’t your jam, no worries—there are tons of great softcover bullet journals out there, too, and this Lemome model is a great place to start. It’s totally budget-friendly and you’ve got a choice between blank, dotted, or squared pages. Because it’s soft, it’s flexible and can be folded to fit in the pocket of a bag, but it’s also durable, so you won’t totally destroy it in the process. This one also features archival quality paper, meaning it’s 20-50% thicker than regular paper. It’ll resist feathering, ghosting, and bleeding, but it won’t add any extra bulk to the journal. The cover is made out of soft suede, so aesthetically, it’s a total win. Once you break it in a bit, it’ll lie completely flat, so don’t worry if it doesn’t the day you start writing in it. Committed to spiral notebooks? There’s a bullet journal, for you, too! The Miliko spiral notebook can be blank, dotted, ruled, or square, and it’s got a transparent hardcover to keep it protected. Trust us, this isn’t one of those flimsy spiral notebooks you used in high school. It comes in a choice of two different sizes, depending on whether you need one small enough to carry around or not. According to online reviewers, this one has a slight advantage over hard/soft covers is the fact that open the notebook all the way and fold back the cover. The best part is this comes in a pack, so you’ll get two journals for the price of one. A work bullet journal can be a lifesaver for keeping your life organized, but it’s going to need to be a little more professional than your at home journal might be (read: no funky colors or patterns, here). This Lemome model is a no-brainer. Not only does it have a durable hardcover that is practical as well as elegant, but it’s also got premium thick paper, so you don’t have to worry about bleed-through. It’s got a ribbon marker, so you won’t lose your place amongst the chaos, and the black exterior keeps it feeling classic and timeless. If you’re constantly jumping from meeting to meeting, you’ll love the pen loop to keep your writing tool secure when you’re on-the-go. Interested in reading more reviews? Take a look at our selection of the best self-journals. Our writers spent 4 hours researching the most popular bullet journals on the market. Before making their final recommendations, they considered 20 different bullet journals overall, screened options from 18 different brands and manufacturers, and read over 50 user reviews (both positive and negative). All of this research adds up to recommendations you can trust.